Last week marked the 50th anniversary of the Six-Day War, June 5-10, 1967, when Israel won a swift, thoroughly decisive victory over its hostile Arab neighbors. Threatened by blockades and likely military attack, Israel struck first, shattering the gathering enemy forces and taking control of the Sinai Peninsula and Gaza Strip from Egypt; the Jordan River's West Bank, including all of Jerusalem, from Jordan; and the Golan Heights from Syria. In just six days, the Israeli David stunned the Soviet-backed Arab Goliath, changing Middle Eastern history forever. 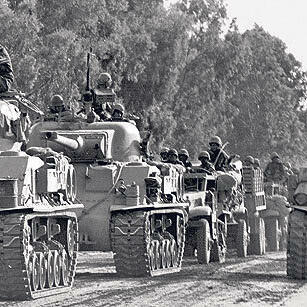 In the subsequent Yom Kippur War, launched and led by Egypt in 1973 to regain the lost territories, Israel prevailed again. Israel's twin military victories made it unmistakably clear that conventional military force would not drive Israel into the Mediterranean Sea. Arab governments and the broader Muslim world faced a choice: Accept the reality of the Jewish state, or condemn themselves to continued conflict. A small number, particularly Egypt's Anwar Sadat, who had taken power after Gamal Nasser's death in 1970, wisely chose peace, and negotiated the 1979 Camp David peace agreement (later followed by Jordan). Tragically, in response to Sadat's courage and leadership, Egypt's Muslim Brotherhood assassinated him in 1981. For many in the West, Sadat's murder was the first glimmering of latent Islamist terrorism, which grew geometrically over the following decades. The little-noticed but steadily rising radicalism soon succeeded the secular wave of Pan-Arabism, which had dominated the Middle East during the post-colonial era. Although Pan-Arabism was secular and modernizing whereas radical Islam was religious and regressive, both were profoundly anti-Western, especially anti-American and anti-Israeli. This civil war within Islam, as Jordan's King Abdullah later described it, brought decades of terrorism across the region and the world, including the radical Shia ayatollahs gaining power in Iran. Tehran has served as terrorism's central banker — and its leading aspirant to gain deliverable nuclear weapons. The major threat facing Israel today comes not from Arab states bordering Israel but from Iran. The 1979 Islamic Revolution has not lost its ideological edge, but has instead made progress toward the strategic goal of dominating a geographical crescent reaching from Iran itself; through an Iraq largely dominated by Shia interests subordinate to Tehran; Syria's Assad regime; and a Lebanon dominated by Hezbollah, the Shia terrorist group. And, under the protective cover of President Obama's misbegotten 2015 nuclear deal, Iran received enormous economic benefits in return for token concessions on its nuclear program, which continues essentially unabated and inadequately monitored. Today, both Israel and America face these common challenges of international terrorism and nuclear proliferation. The Trump administration is now addressing the daunting task of climbing out of the national-security chasm into which the Obama administration consigned it.